I love a rare gem in a usual mess of mass consumerism. 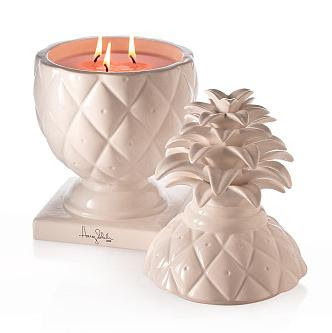 This is the second year (well, the second year I've noticed) that Harry Slatkin has designed a magnificent pineapple candle for Bath & Body Works. I bought two small ones last year and picked up this wonderfully large pedastal version on Friday, solely for the container. To my surprise, the candle actually smells great (sun-ripened, sugared pineapple, infused with the essence of white orchid and jasmine). I'd love to see a pair of these on either side of a mantle against a green glazed wall. They go for $40 a pop, but if you spend $20, they're only $25 each. So, technically you can get two for $65. I'm totally buying 2 of these now & putting them on my mantle! So cute! Love your blog! I am loving these. It reminds me of something I did with creamware apothocary jars in my kitchen window. Adding to "wantwantwant." Whoever says you can't improve on Mother Nature hasn't met Harry Slatkin or enjoyed the pure, fresh, true fragrances he creates. In just a few minutes after lighting a Slatkin candle I can close my eyes and it's as if I've been transported to a pine forest or am about to taste a ripe citrus fruit or sip from a cup of steaming espresso. His scents are limited only by his imagination and that is boundless. A current favorite at our house is his Pineapple Orchid candle. A romantic, sunny blend of sugared pineapple, white orchid and jasmine, it returns us to white sandy beaches, palm trees, and the soft warm air we so love in the tropics. Guests smile with pleasure as they first sense this welcoming aroma. Of course, when the candle is gone we can use the holder for any number of things from flowers to candy to jewelry. Truth is the fragrance is so enchanting that we'll have quite a few empty pineapple holders before long. Summer is even sunnier with Harry's latest candle, a fabulous fusion of fruit and floral.